This FAQ shows you how to import address book or contact information exported from other email clients into your new Address Book. Please refer to the “How to export Address Book from Bloomland's Email platforms” FAQ for information on exporting Address Book or Contacts List from that platform. 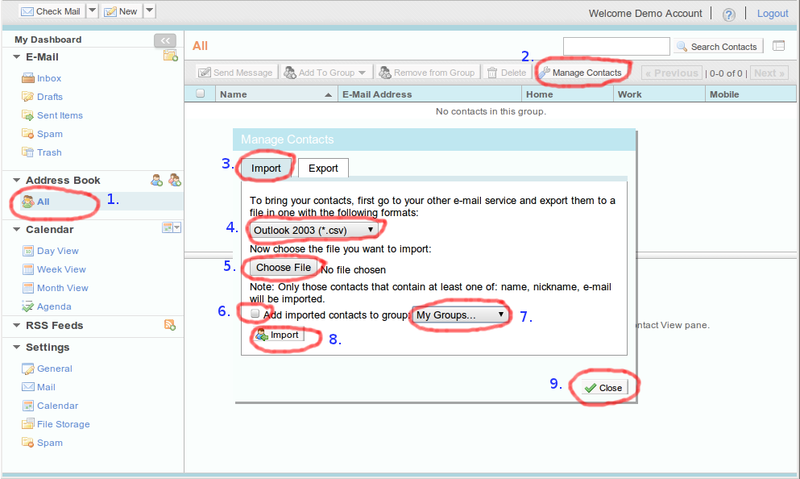 Select an Address Book in the left-pane of the Webmail interface. Click “Manage Contacts” tab as shown in Fig. 1 above. Click “Import” tab (selected by default) in the “Manage Contacts” dialog box. Make sure you select “Outlook 2003 (*.csv)” on the drop-down list for the file type you want to import, as shown in Fig. 1 above. Click “Choose File” button to locate the address book file you've exported from other Email Clients that you want to import now. Select the check-box for “Add imported contacts to group” if you have created Address Groups in your Address Book. If not, goto Step 8. Select the Address Group from the “My Groups” drop-down list to import the contacts into. Otherwise, all imported contacts will not be grouped. Repeat Step 3 to Step 8 for additional address book file exported from other email clients that you may have. Click “Close” to exit the “Manage Contacts” dialog.